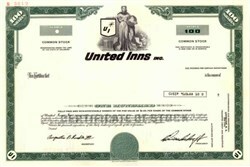 Beautifully engraved specimen certificate from the United Inns Inc.. This historic document was printed by the Security-Columbian Banknote Company and has an ornate border around it with a vignette of an allegorical woman by the company logo. Bristol Hotels & Resorts began operations as The Harvey Hotel Company with one hotel in 1981. From 1982 to 1994, nine additional hotels were developed in Dallas, Houston and Wichita, Kansas. In 1995, Harvey acquired 26 hotels by merging with Memphis-based United Inns, Inc. The acquired properties were in excellent locations, but most were in disrepair due to poor management and the industry downturn of the late 1980s. Later in 1995, the company�s name changed to Bristol Hotel Company. Bristol went public in December 1995 with an initial public offering that raised $100 million. Between 1995 and 1996, a $130 million redevelopment program renovated 20 of the 26 properties acquired in the United Inns merger. As a result of the renovations and Bristol�s superior management, the properties recorded tremendous increases in occupancy, average daily rate, food and beverage revenue, and profitability. In January 1997, Bristol Hotel Company purchased Chicago�s historic landmark Allerton Hotel. The hotel is located on the �Magnificent Mile� of North Michigan Avenue, one of the premier retail shopping districts in the world. A comprehensive renovation completed in May, 1999 converted the property to a Crowne Plaza hotel with more than 440 guest rooms and suites. In April 1997, Bristol Hotel Company acquired 60 Holiday Inn hotels for $665 million from U.K.-based Bass PLC, the parent company of Bass Hotels & Resorts. The Bass acquisition has created tremendous synergies and growth opportunities by combining Bristol�s 18-year record of operating expertise with Holiday Inn�s strong name recognition and its worldwide reservations system. In April 1998, Bristol Hotel Company acquired 20 hotels in the Midwest for $100 million from Omaha Hotel, Inc. In July 1998, Bristol Hotel Company spun off its non-real-estate assets into a separate public company, Bristol Hotels & Resorts (NYSE: BH), creating the largest independent hotel operating company in North America. Bristol transferred its real estate holdings to FelCor Lodging Trust through a merger, establishing FelCor as one of the largest hotel REITs (real estate investment trust) in the nation. Bristol operates the hotels acquired by FelCor under long-term lease agreements. On April 3, 2000, Bristol Hotels & Resorts was acquired by Bass PLC of London, parent company of Atlanta-based Bass Hotels & Resorts.